Making the most of open space is so important when you've got kids to entertain. Here Local Mums recommend Priory Farm, an outdoor party venue offering fish feeding, fresh air and fun. “I highly recommend�The Discovery Walk, Priory Farm�to all Local Mums.�The children loved the challenge of having to work out the answers to the questions and at the same time learning about the environment.�As an Early Years teacher I am very aware that children are not often allowed to think and work things out for themselves so places like Priory Farm are well worth a visit to allow children to be free and explore the natural habitat while parents have the comfort of knowing their children are safe.�The Discovery Walk�is�a super place to visit and I love the fact that it has not been spoilt with an abundance of commercialisation!" But there’s much more to The Discovery Walk than just an outdoor space. �Firstly, there’s an interactive nature quiz which is skilfully designed on two levels to fascinate pre-readers and challenge older kids, who’ll love following the “extra action” clues to work out the answers to countryside questions. Then there’s more fun at every turn: deep, dark dens that kids love to squeeze into; a labyrinth that’s just made for scrambling through and, in high summer, the sunflower maize which looks every bit as good as it sounds. Which brings us to the fish. In what must be a ‘first’ for a children’s attraction (or even an adults’), Priory Farm has built a railed, low bridge over the lake. At the end of the bridge is a bell. �Ring it and watch as the water becomes alive with hundreds of hungry fish waiting to be fed on the special food, provided in bags by the farm. It really is magical - and amazing to watch the looks on the kids’ faces as the fish emerge from the seemingly lifeless depths. Far from mainstream, The Discovery Walk is well worth discovering. 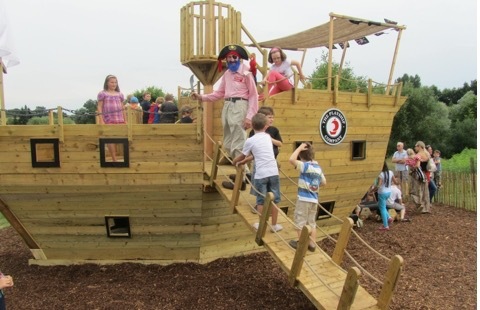 Priory Farm’s Discovery Walk hosts children's parties for any occasion, so whether it's a birthday celebration, family gathering or a post-natal class reunion, this will definitely be a party with a difference. There's plenty of space and undercover seating available for groups of up to 50. 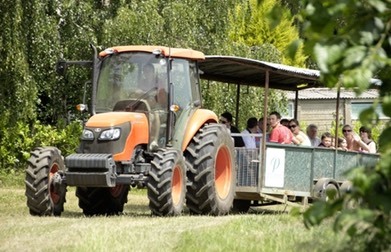 The farm is happy to organise party food boxes, tractor and trailer rides, bouncy castle, nature trail, bug hunt, craft activities �... and is open to ideas. Prices start at just �50 for use of the facilities but it's best to give them a call or email as each party is different.